Let me clear the point! I always hail the Indian government for introducing bang of retirement plans. If you follow the right approach, you can have a great post-retirement life. The government has come up with schemes like national pension scheme, employee provident fund and public provident fund, etc. Choosing the wrong scheme is the most common mistake practiced by people. The pension will drive the regular stream of fixed income. While the provident fund will come up with lump sum withdrawal. You getting the point here! You have to plan for both! Although, people always tend to differentiate between schemes. But recently, the buzz was created because of Union Budget 2016. In which, the government came up with one-time tax exemption idea if EPF subscriber switch to NPS! In simple word, the government is saying, switch from EPF to NPS to avail tax exemption. Now you must be thinking, should you opt for this? In my opinion, no don’t go for it. Yeah, I know, both schemes have their own charms. And that is the point! You gotta keep them both for brighter retirement plan! That’s why I come up with a comparison of EPF Vs NPS. By the end of the article, you will drop the idea of switching from EPF to NPS! EPF contributions are necessary for a salaried person, who are earning more than Rs.15000 per month. You have to contribute at least 12 percent of your pay towards the EPF account. Secondly, you employer has to match your contributions too. Talking about tax benefits, you can get tax exemptions up to Rs. 2 lakh a year. On the other hand, NPS is a voluntary scheme. You can start the contributions from Rs. 500 to a maximum of Rs. 1.5 lakh a year. Unlike EPF, the contributions are yearly. So, it is okay to skip contributions for few months. 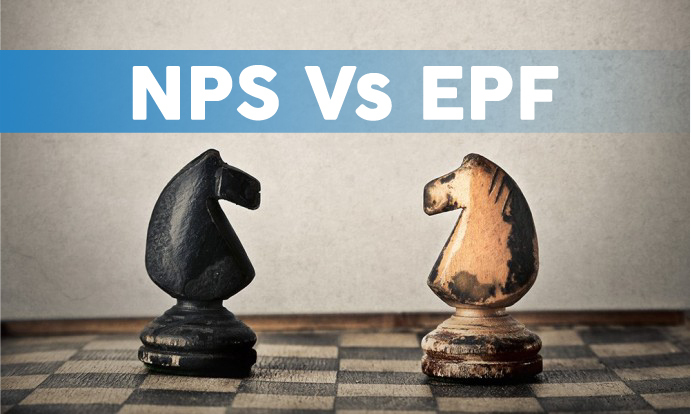 NPS Vs EPF – Here Is How To Decide! For a salaried person with saving habit, EPF is a perfect investment option. In simple words, it is an ultimate safe investment option. Your money will be invested in government securities, bonds, and PSUs deposits. Precisely, the government forward 40% towards G-securities, 32% to PSU debt and rest in other schemes. This way, your EPF kitty get managed. Mostly, the government buys the schemes or bonds till maturity. So, there is no chance of management of the portfolio. This is the safe method with low but fixed returns. The portfolio is the main attraction of NPS. In fact, it is the key differentiator. We all know, equity investment options always come with fancy returns. And the government is giving you such chance. Here, you have complete power to distribute investment in equity, bonds, and government securities. Another attraction is management of the portfolio. Either you can do it yourself, or hire a pension fund manager. Isn’t cool? The authorities choose and distribute your funds in government bonds or securities, in the case of EPF. As mentioned above, in NPS you have the power. You can relocate the funds or fund manager once in a year. Now, if you are a finance geek, you can exploit this feature. For instance, you may remove funds from G-sec in a case of rising rate scenario. And vice versa! Equity and debt market always come with handsome returns when the market is booming. In last two years, the returns were witnessed to be double! Wow! The EPF trustees decide the rate of return every year. Currently, the interest rate is 8.75%, which is pretty decent. NPS is all about finance game. You better be good at asset allocation for the better rate of returns. Equity returns are huge but volatile too. Government securities offer low but fixed rate or returns! Your EPF portfolio will remain private with EPF authorities. But as it is government backed scheme, so there will be no chance of default on any payment. Most importantly, the rate of returns is publically announced and publicized. Unlike EPF, the NPS portfolio is in front of you. In fact, you have created it. You may have access to the portfolio, but gauging it is not easy. When you have put money in different baskets, it is your job to collect and compile them. After retirement, you can have EPF withdrawal in lump sum amount. If you resign before the retirement, still can withdrawal EPF balance. In fact, you may draw funds for special circumstances like the construction of purchase of a home, education or marriage, etc. I call NPS as a hybrid of pension and provident fund. You can never withdraw 100% amount from NPS, even after retirement. You have to use 40% of the balance for annuity at least. For premature withdrawal, still, you gotta put 80% of the balance in an annuity. It is a big drawback here! Investment towards EPF are levied under section 80 C. The interest earned and withdrawal corpus is not taxable. But don’t withdraw EPF balance within five years of opening the account. In the case of NPS, you have tax exemption up to Rs. 2 lakh per year. But the withdrawal corpus and annuities are taxable. Bottom Line – Should You Switch? No! It’s a big no! Never opt for NPS from EPF. People frequently ask, which one is better. My honest opinion, I can’t distinguish. Both schemes come with their own benefits. The key to success is a contribution towards both schemes. At one hand, you have to contribute necessarily to EPF. No excuse for that! But NPS comes with flexible contribution feature. It is yearly and starts from lowest Rs. 500. So, if you pay attention, it is easy to have both of them!